As marketers and communicators, we go to where the audiences are online to deliver and receive messages. Today, that is Facebook. With over 500 million users and a daily usage that surpasses that of Google, using Facebook as a communications channel by any large business or institution is essential. Branding a Facebook page is not as easy as setting up an account. By default, a fan page opens on the Facebook wall feed. From an engagement perspective, this is the best option as it presents no barrier to immediately communication between you and your fans. From a marketing or branding perspective, however, it presents a challenge, as their is no real estate for evergreen or promotional material that you might want to stay sticky at a top level for a few weeks or months. The only option would be to continually post about such an event or campaign, which would quickly be seen as spammy by your audiences and hurt your overall social reputation. Like many Facebook custom pages, the top banner calls attention to the Like button and contains a Call to Action to click the button. 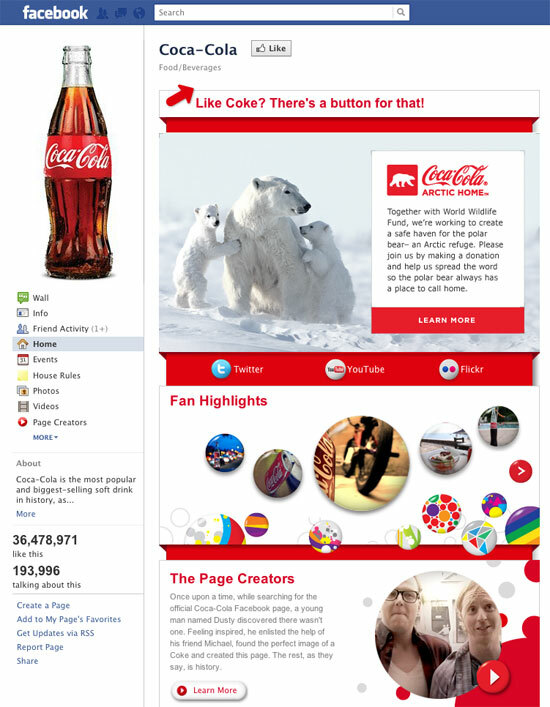 Originally, custom Facebook pages were created using a programming language called FBML, Facebook Markup Language. Pages were created by users and then hosted by Facebook. Images, Videos, and other materials were hosted on another website and called into the Facebook page. Earlier this year, Facebook announced that FBML was being deprecated in favor of having developers build custom pages the Developer Application. 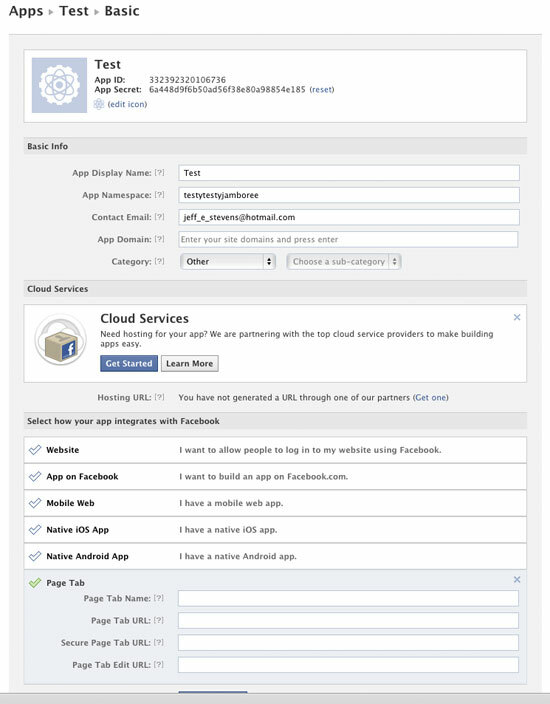 This new method requires you to create a local HTML page that is then imported into Facebook using an iframe. You’ll need to create a web page using your standard web development tools. This page and any accompanying files would need to be then uploaded to your web server so it can be accessed by Facebook. The iframe has a set width of 520 pixels and 800 pixels in height. Your content can be longer than this, but be aware this will create a scroll bar to the right and you’ll need to accommodate for that in your design (leave 20 pixels available for the scroll bar on the right). Cick on the button that says “Create a new App”. Will you need to give your application a name visible to the public (Name) and a name for the Open Graph measuring tool (App Namespace). You’ll have to complete a Captca as well to verify you are a human.Give your app a name and also add an icon since it will show up in your Facebook page. Upload a custom icon to show next to your page. The icon will be rendered as 16 x 16 pixels, so think along the lines of a favicon. This page will give a dialog box that will ask you to specify what page you are an administrator of that the tab should be added to. What Does Web Services Have in the Works? As you may have noted above, the dimensions of a custom Facebook landing page are smaller than those of the new UF&Shands WordPress theme, Apollo. In order to build a page properly, a unit would need to build a custom HTML solution for the space and host it external of their WordPress instance, which would require both programming and design support, as well as the help of IT staff to host and maintain. After the launch of the UF&SHands website, Web Services will be looking at specialized WordPress templates for smaller goal-specific web sites. One of those in discussion is a Facebook optimized template for Landing Pages, basically a redesign of the current home page design to strip the navigation menus and other elements but retain the titles and branding. This template would allow content authors to continue to use the tools they have learned for WordPress to maintain and update landing pages easily and with minimal IT support. Stay tuned for more information on this template and other templates in the near future. And if you have suggestions or ideas for this or other templates, please contact us – we’d love to hear from you!